Hadley's robot humps no more but sits in workspace in North County. The event is ground zero; the attendees are the blast wave, but what you want — what you can measure — is fallout. 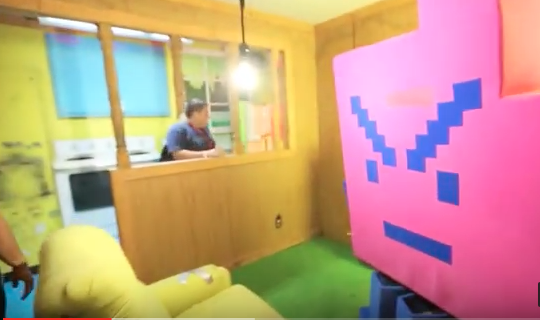 Case in point: Cartoon Network’s Adult Swim Funhouse, a 45-foot-tall showcase for its more outré offerings that debuted at Comic-Con in 2013 and toured college campuses nationwide in 2014. Hadley worked with the network’s creative team to build a portable 15-room maze packed with oddball references to shows such as Aqua Teen Hunger Force and Squidbillies, plus a foundational stage and a massive inflatable tent “that had to zip and tie together and stay inflated and stay tethered to concrete barriers” — which barriers, of course, had to be suitably decorated.